Foreplay means different things to different individuals, but regardless of your interpretation, there was not much romance between FOR-PLAY Manufacturing and the Paramount Studios. In late 1972, FOR-PLAY thought that they might be able to turn an easy profit by merging two entities - neither of which was their own to exploit. Atari founder Nolan Bushnell adapted the mainframe game of Space War! 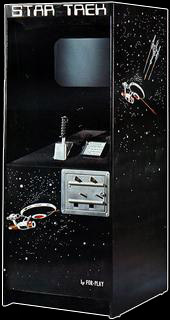 into a coin-operated game renamed Computer Space with the assistance of Nutting Associates. FOR-PLAY attempted to place an unlicensed version of this very game into a cabinet to sell as their own. Since existing copyright laws did not cover the new technology of the time, companies were free to clone the work of others. While not moral by any means, it was, unfortunately, very legal. Patents and laws to protect coin-op manufacturers did not come into play until later in history. FOR-PLAY's big mistake involved using the name of Star Trek to market its product. While the copyright laws did not protect the game design itself, the popular Star Trek name was protected. Copyright attorneys at Paramount Studios were quick to point this fact out to FOR-PLAY in a court of law, and as a result this game went where no coin-op had gone before, making video game history!